This figure shows the different product groups of 802.11 systems and how the data transmission rates have increased in the 802.11 WLAN over time as new more advanced modulation technologies are used. The first systems could only transmit at 1 Mbps. The current evolution of 802.11A and 802.11G allows for data transmission rates of up to 54 Mbps. This book explains the functional parts of a Wireless LAN system and their basic operation. You will learn how WLANs can use an access point to connect to each other or how they can directly connect between two computers. 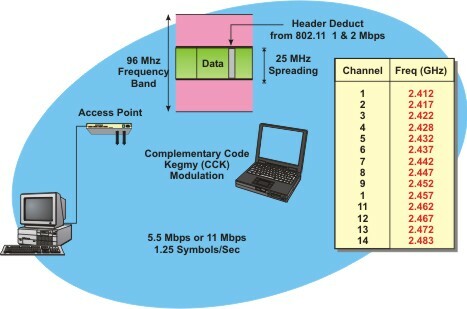 Explained is the basic operation of WLAN systems and how the performance may vary based on a variety of controllable and uncontrollable events. This book will explain the key differences between the WLAN system versions such as frequency and data rate along with which versions are compatible with each other. Tips are included on how to install a WLAN system along with common problems you may encounter and solutions you may use. Discussed are the basic steps for equipment configuration and options you may want to consider to maintain system security.